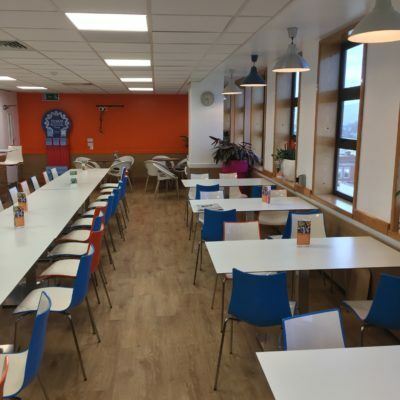 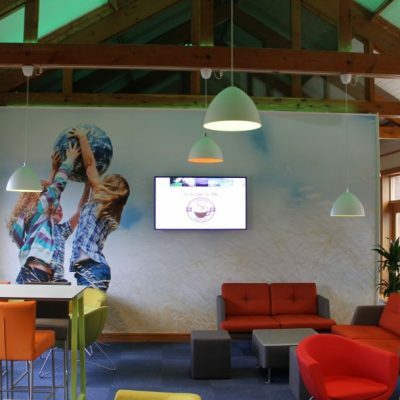 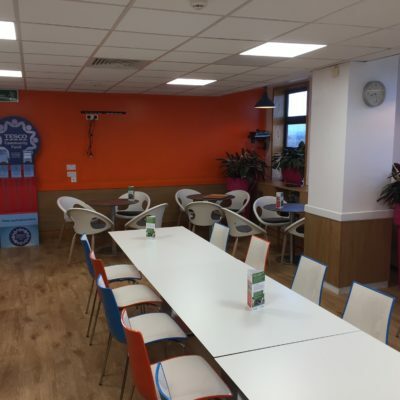 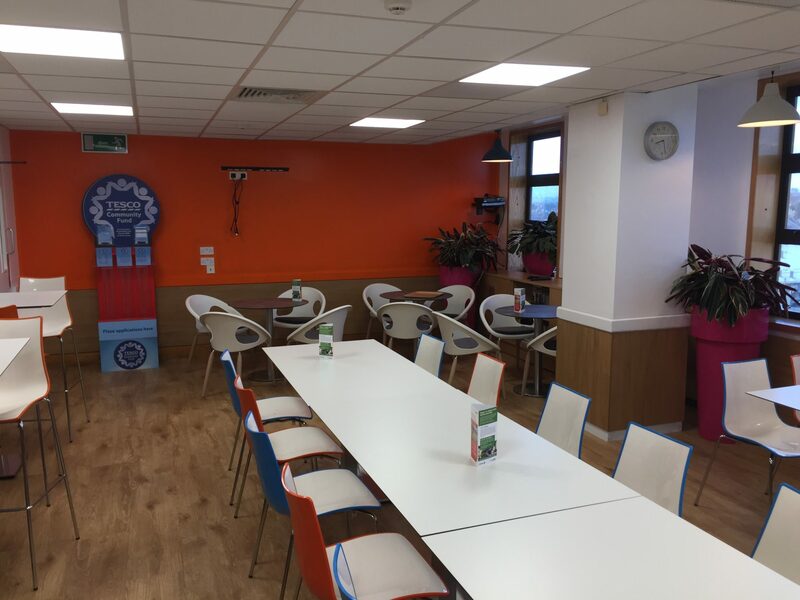 As part of their Head Office revamp, Tesco wanted to update their restaurant to make it a bright and relaxing environment. 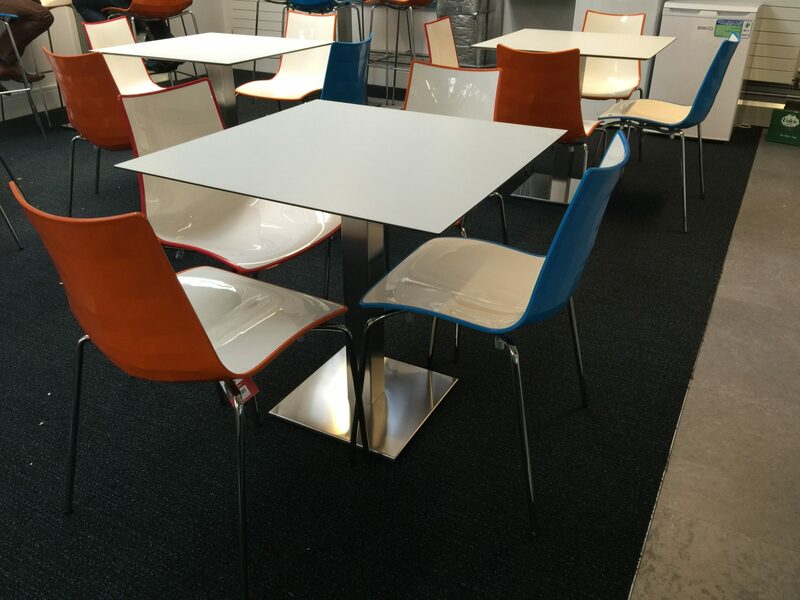 We advised and supplied our popular Zebra dining chairs & bar stools in a mix of colours with white compact laminate tables, standard & counter height with satin chrome bases. 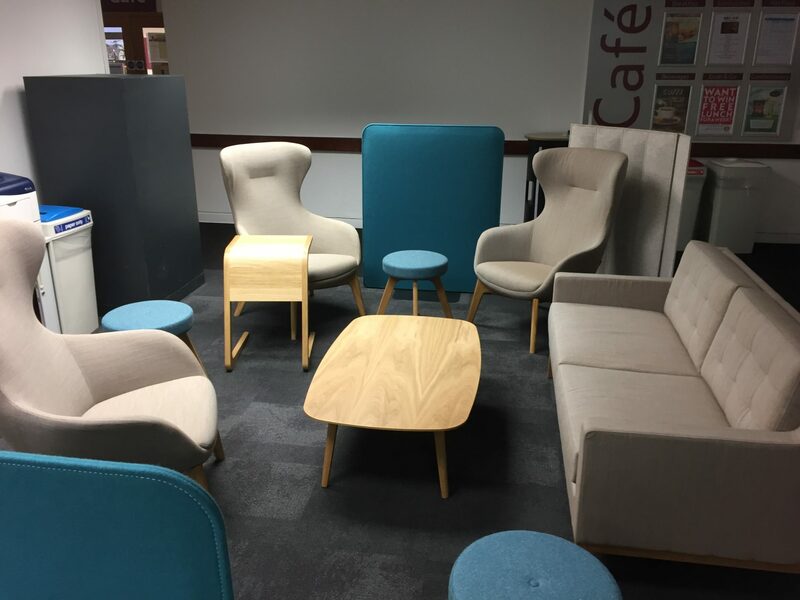 In addition we created a separate area for relaxing over a coffee. 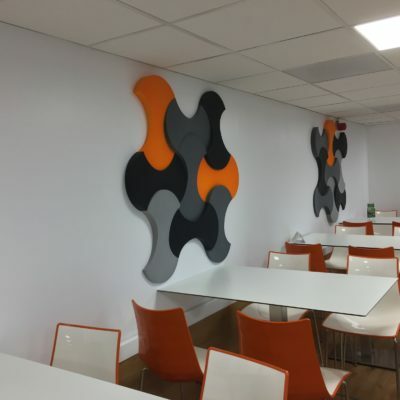 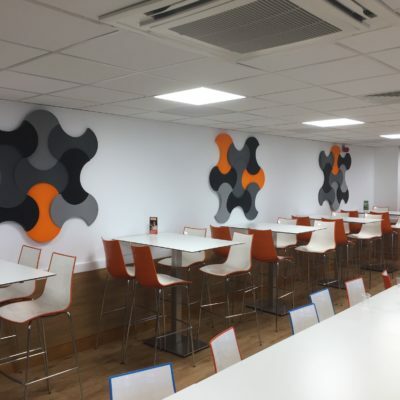 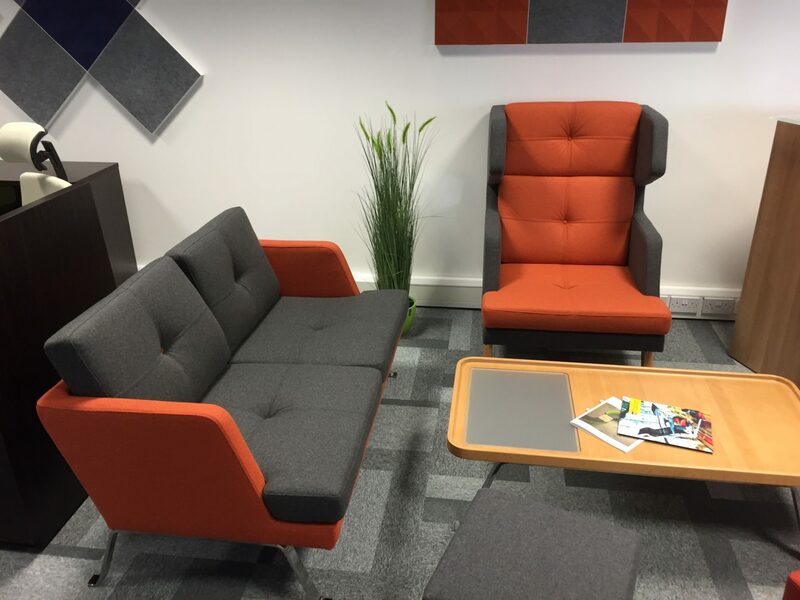 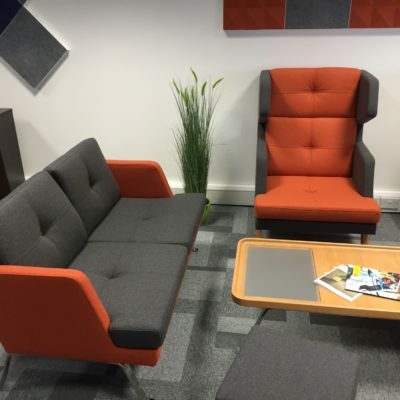 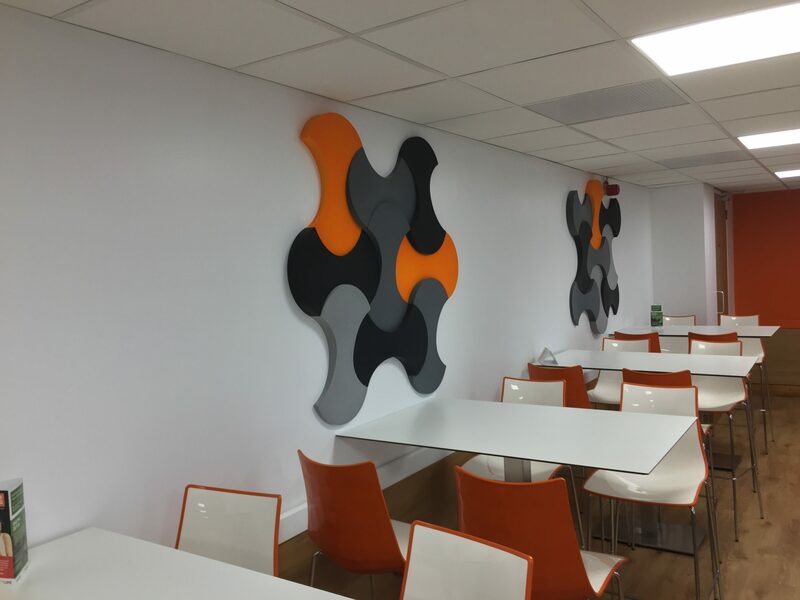 We installed wall acoustics from our Fluffo range to reduce noise and add something a bit different. 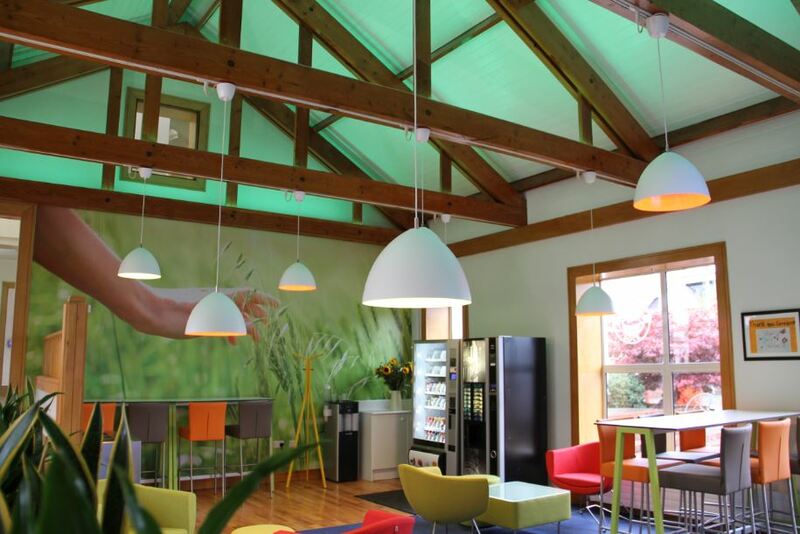 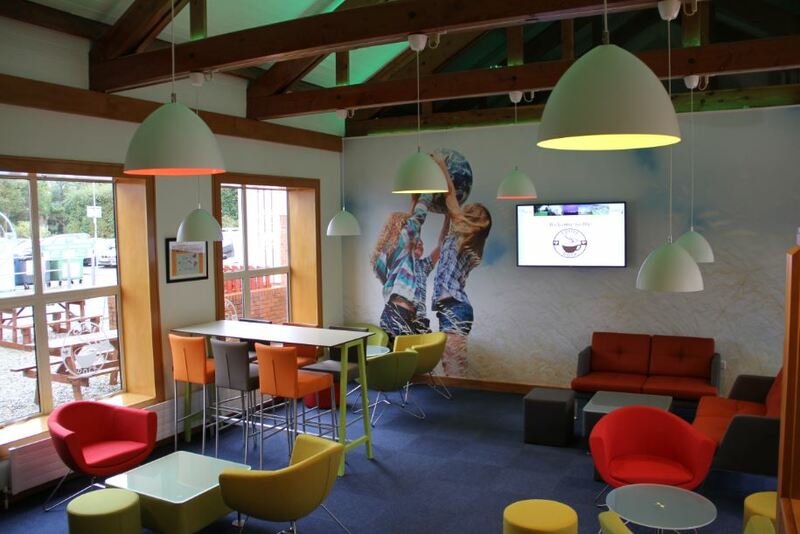 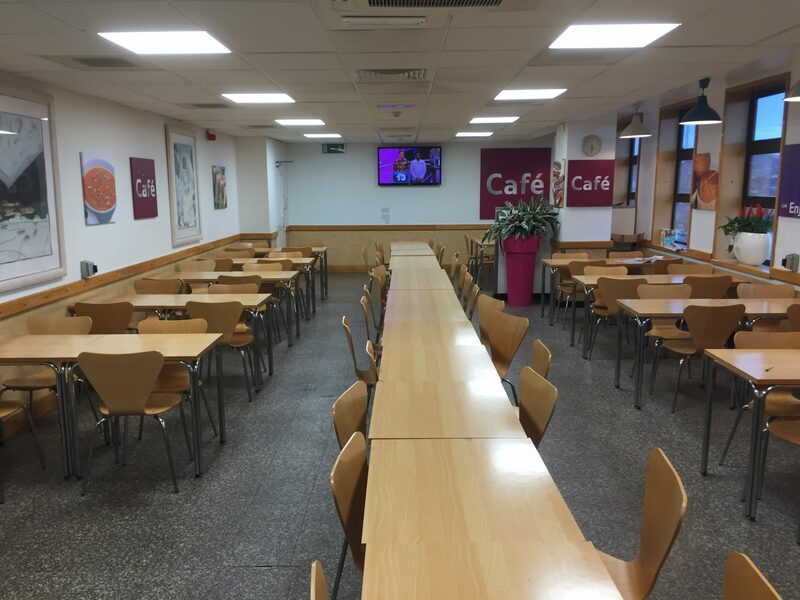 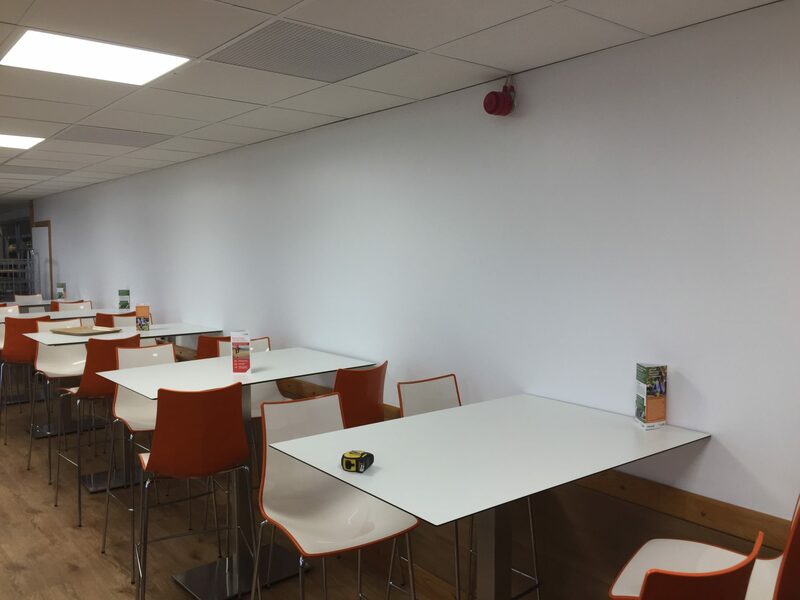 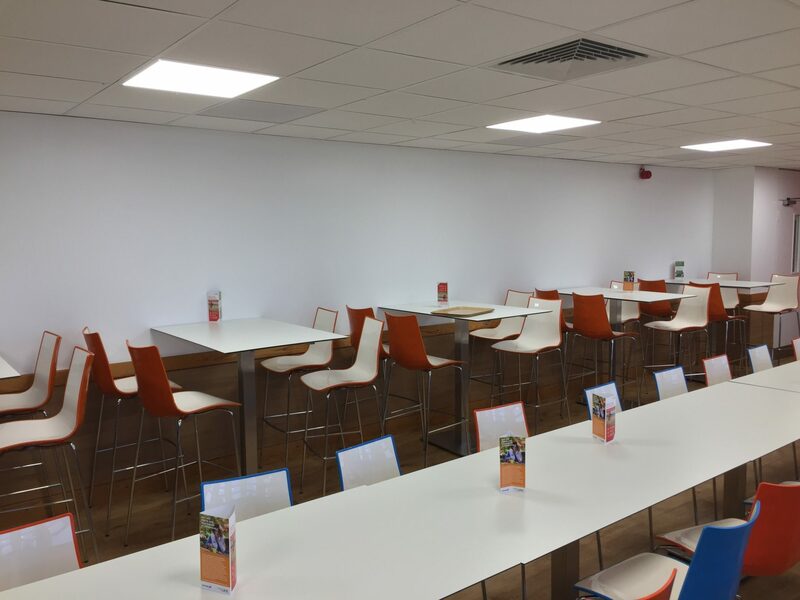 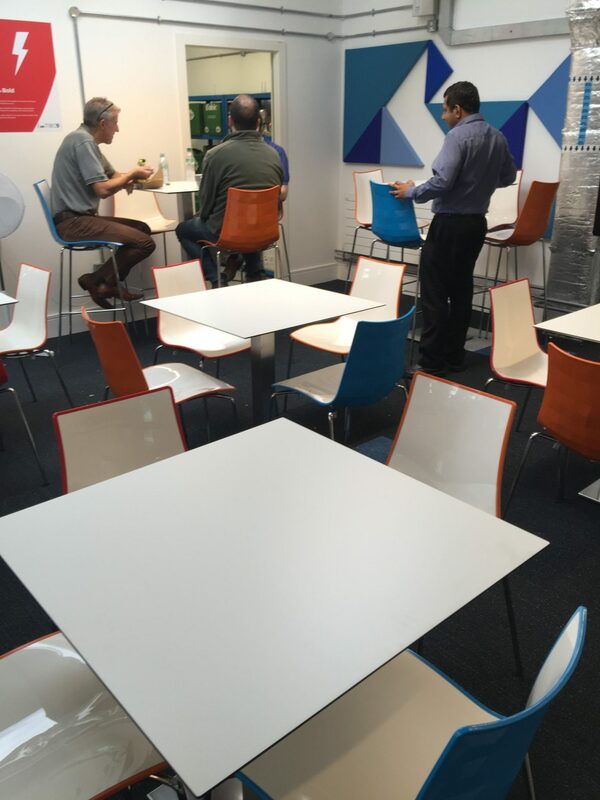 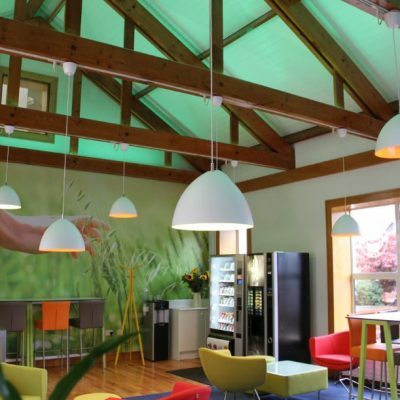 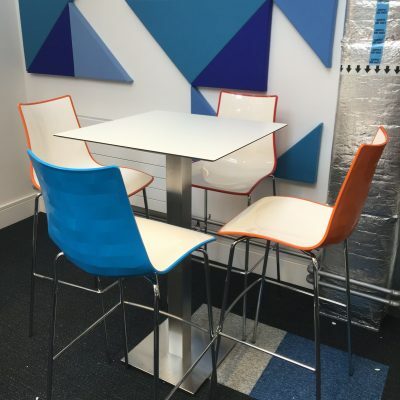 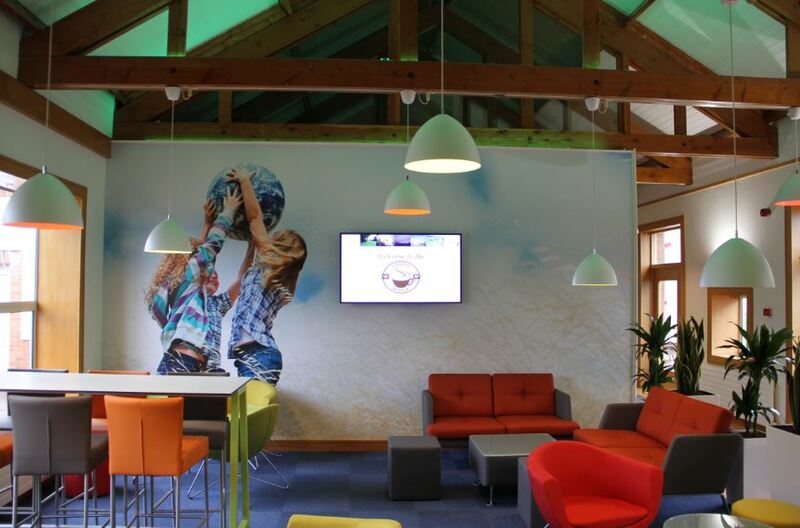 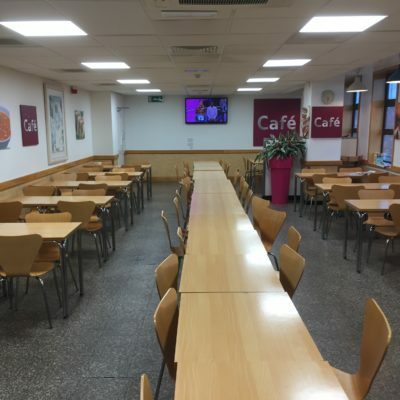 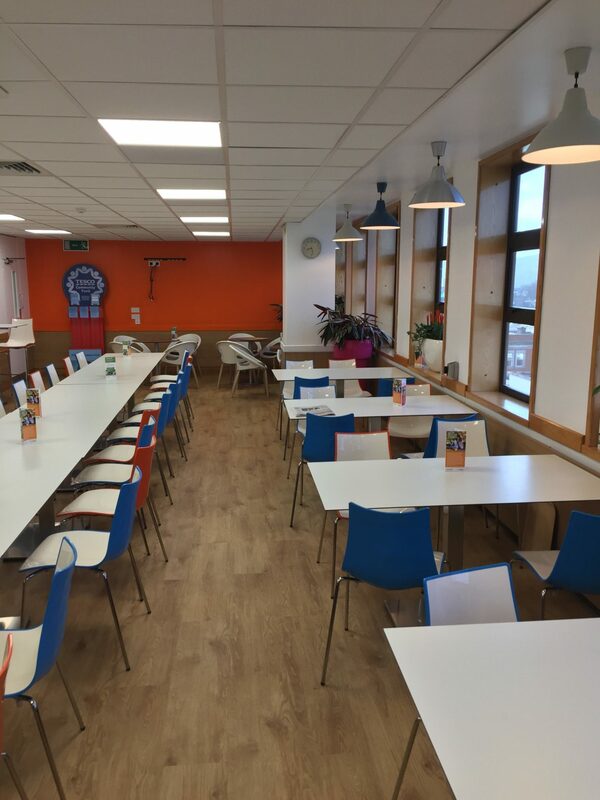 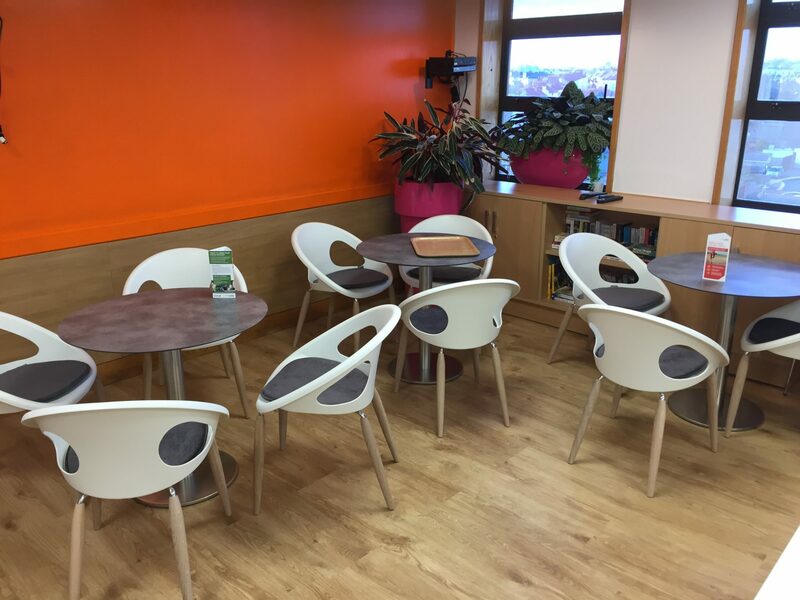 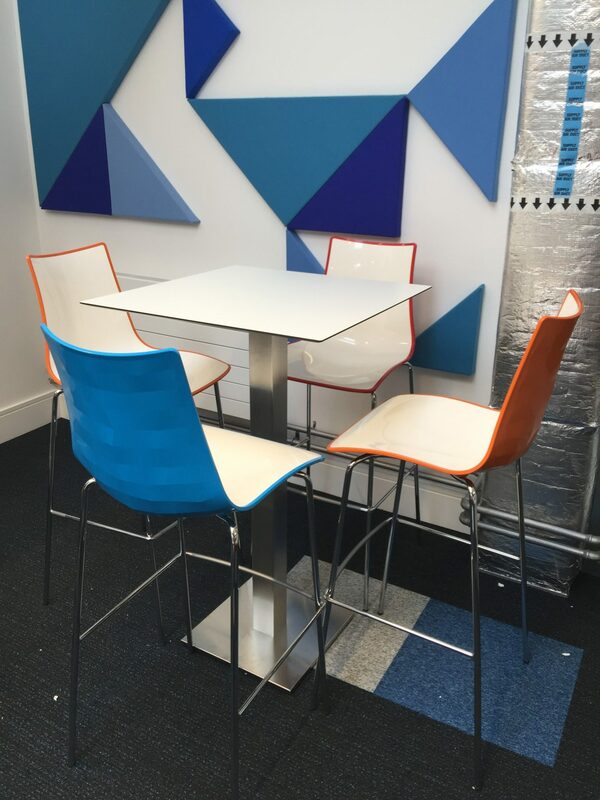 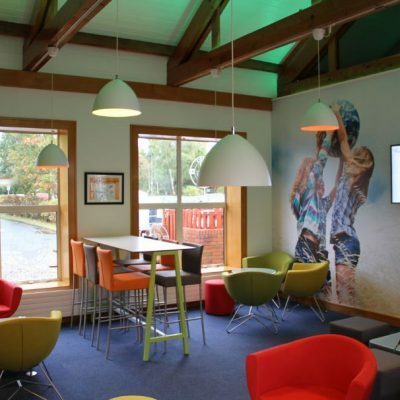 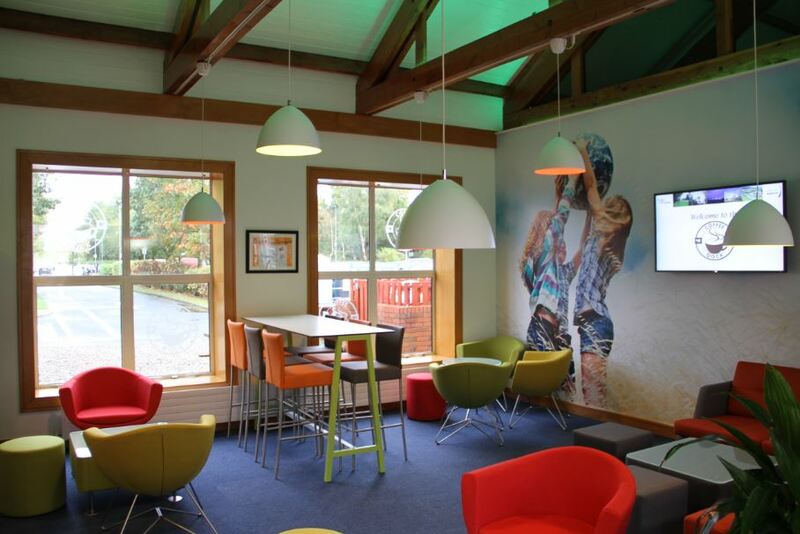 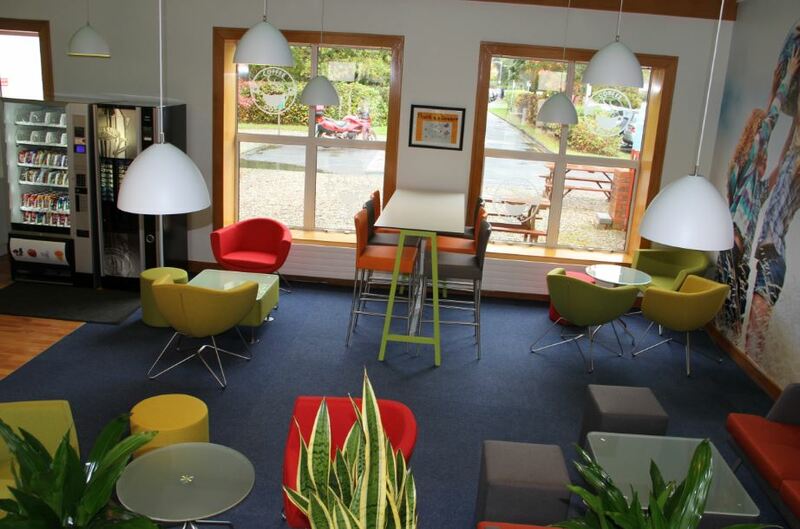 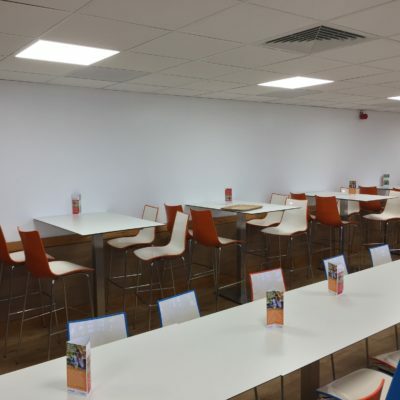 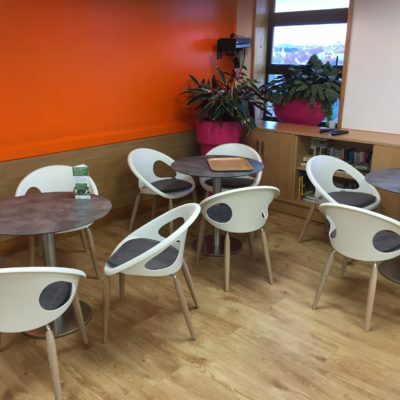 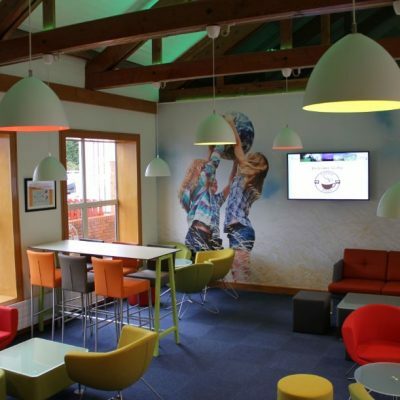 The brief from our client was to create a bright vibrant dining area for their office canteen. 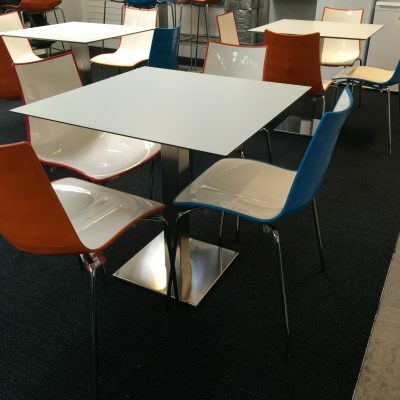 We advised and supplied our popular Zebra dining chairs & bar stools in a mix of colours with white compact laminate tables, standard & counter height with satin chrome bases. 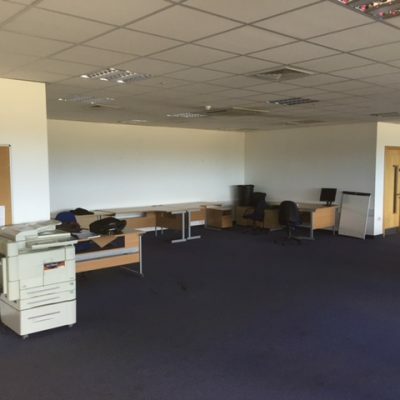 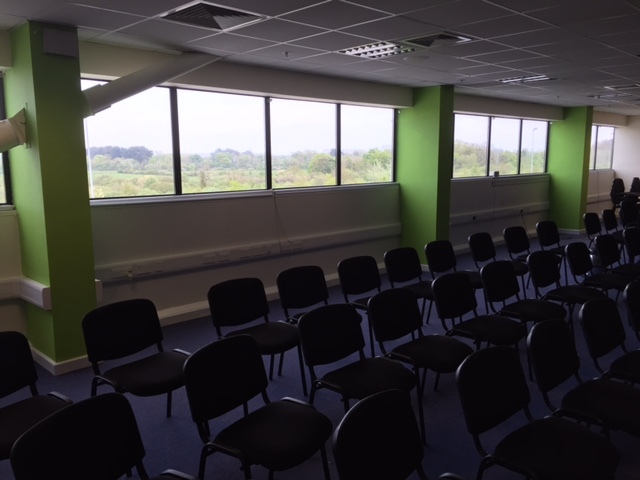 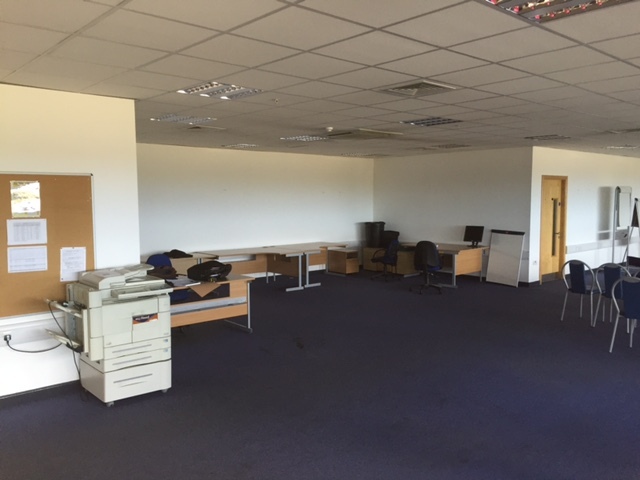 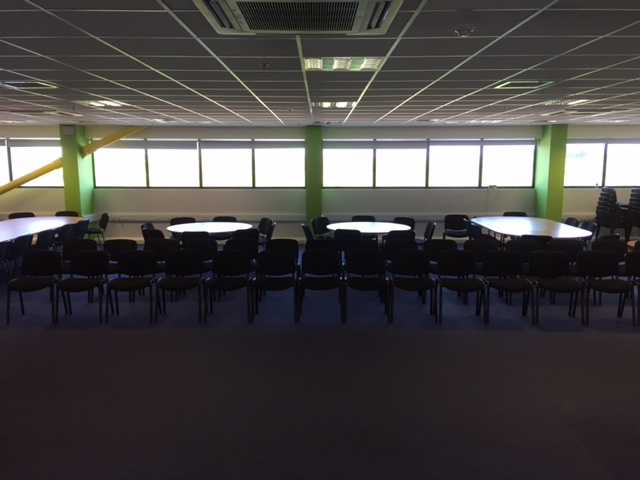 Fit-out of unused office space to create a new conference room to cater for 160 people. 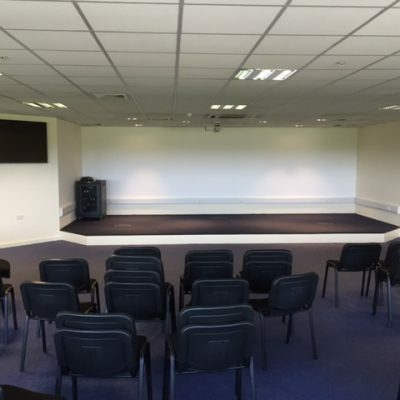 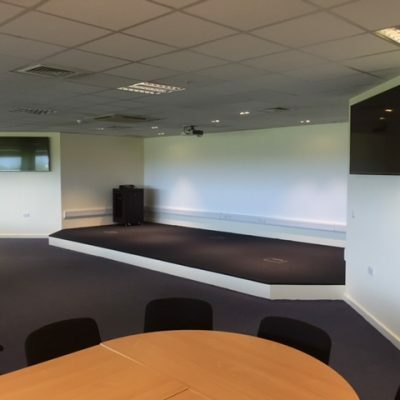 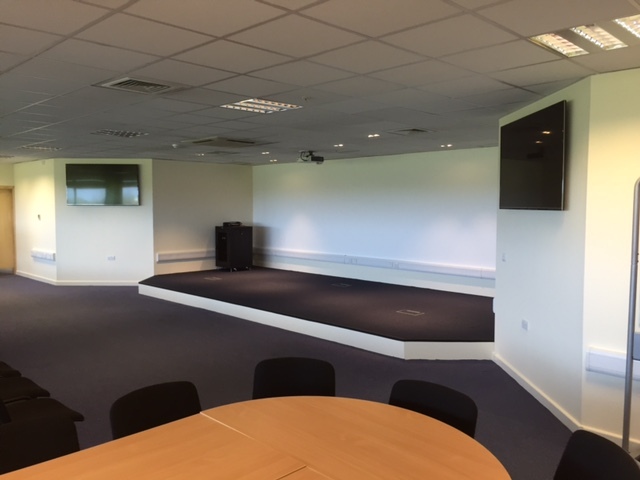 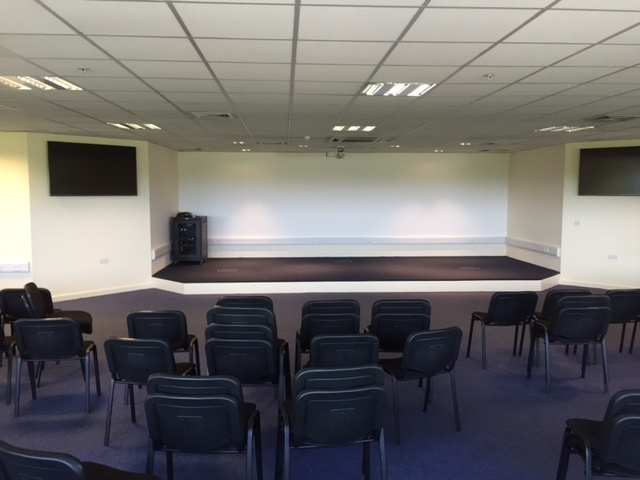 Works included the construction of a raised floor to create a stage area, a full AV wireless solution, reconfiguration of stud partitioning, construction of new entrance and egress areas and painting throughout to include feature colours and AV projection paint. 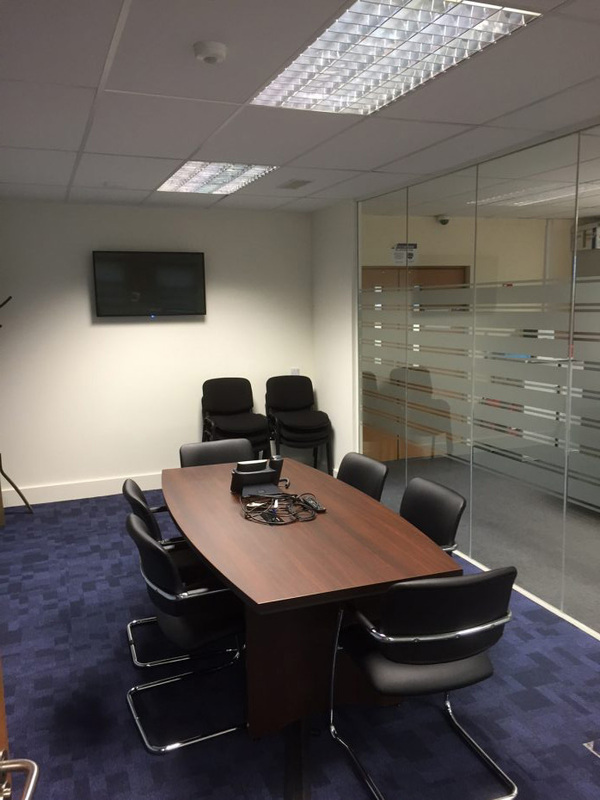 All works completed in time and within budget. 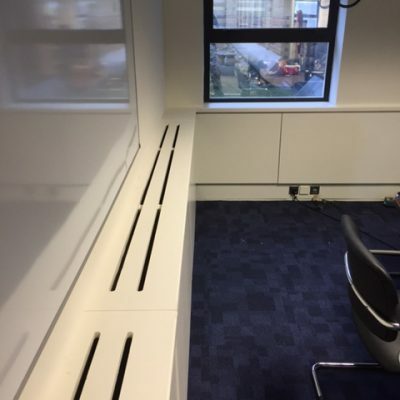 Advise and prepare drawings for the fit-out of a new coffee dock/breakout area. 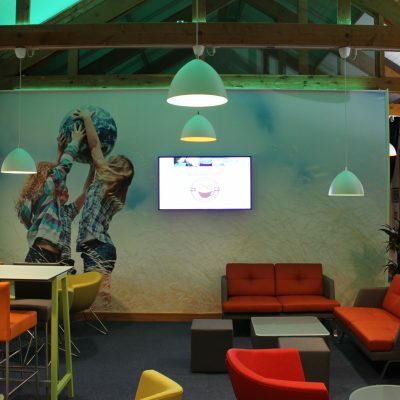 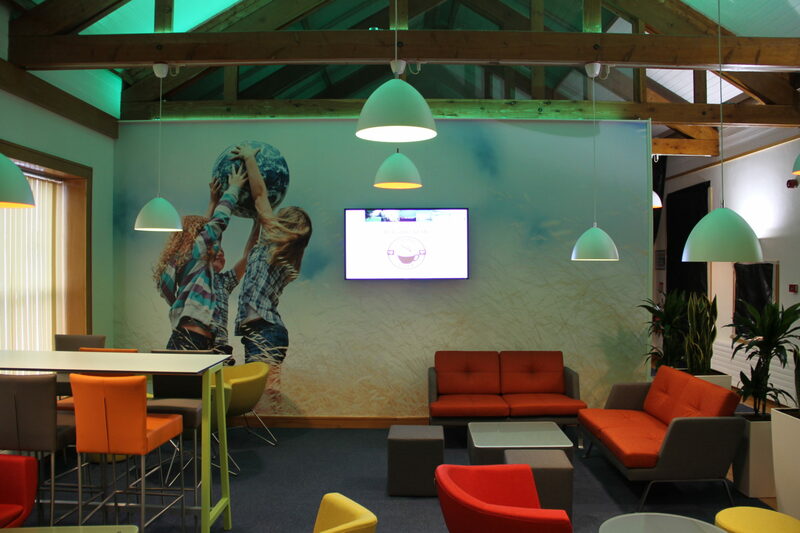 The brief was to create a bright & colouful space that could also be used for informal meetings. 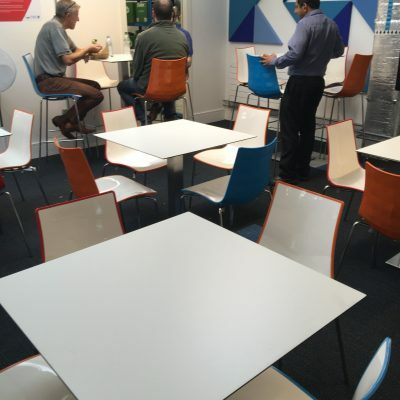 The breakfast bar furniture and soft seating all come from our European manufacturer Profim. 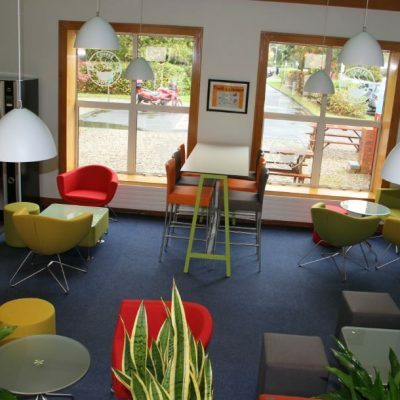 Services: Space planning, Project Management, Building Works, Furniture supply & installation. 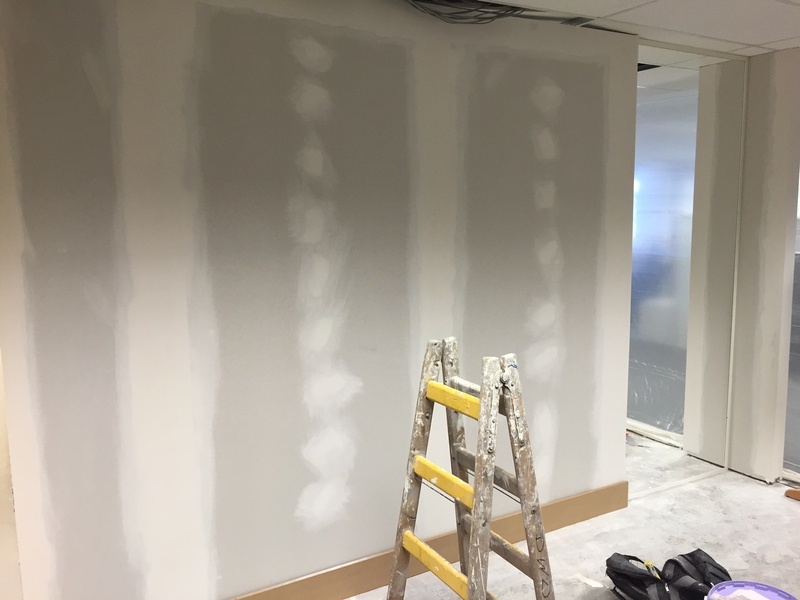 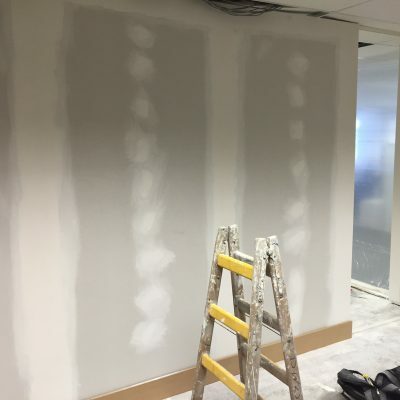 Construction of two new meeting rooms. 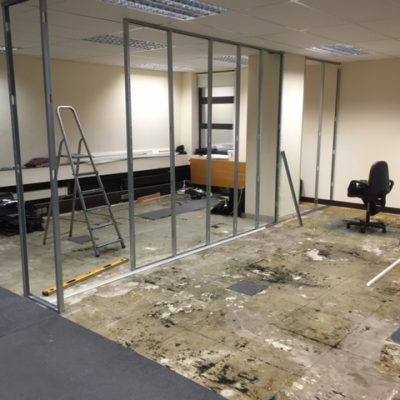 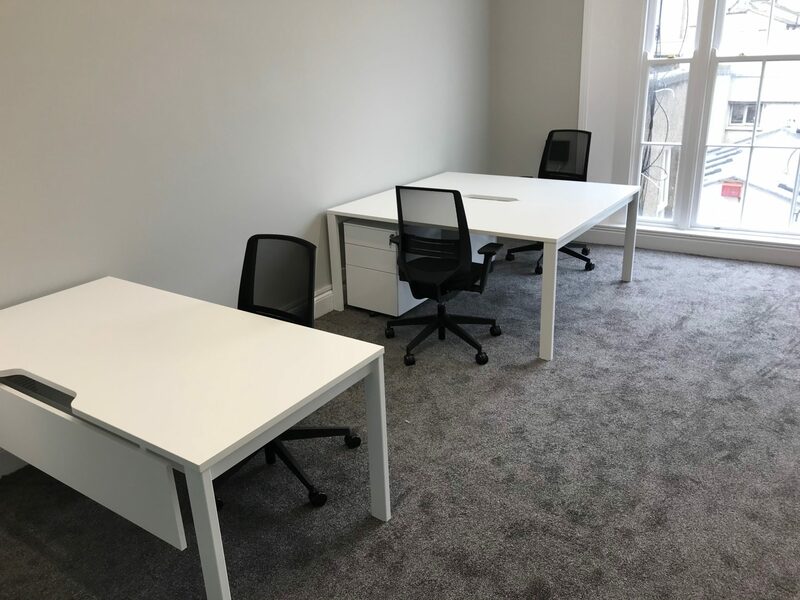 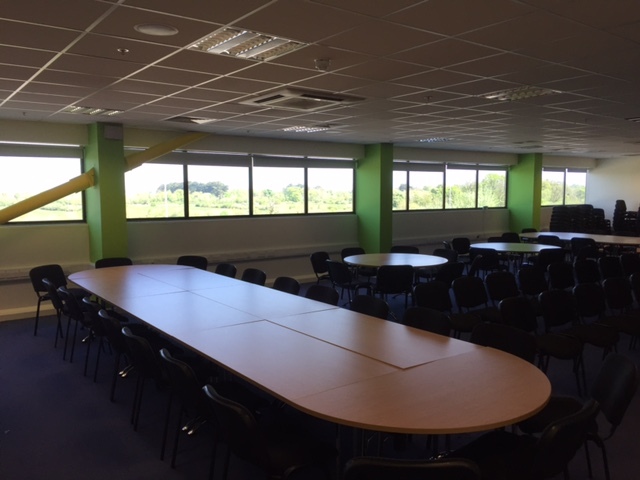 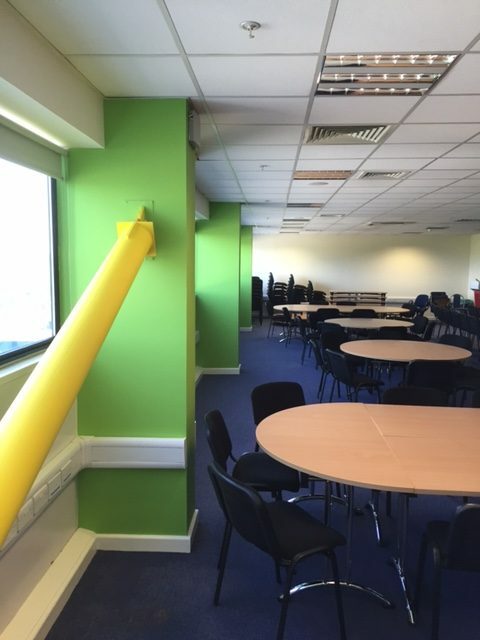 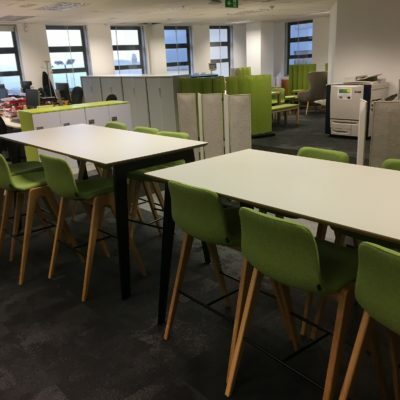 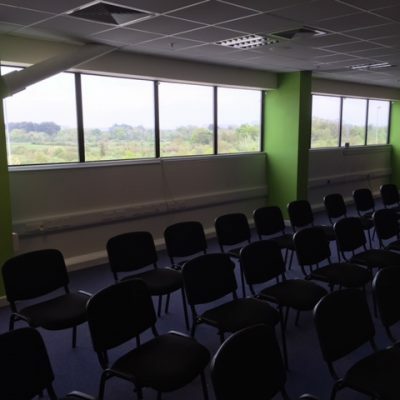 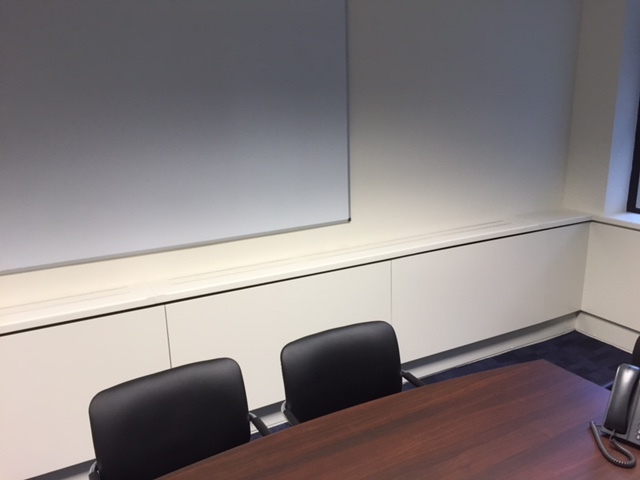 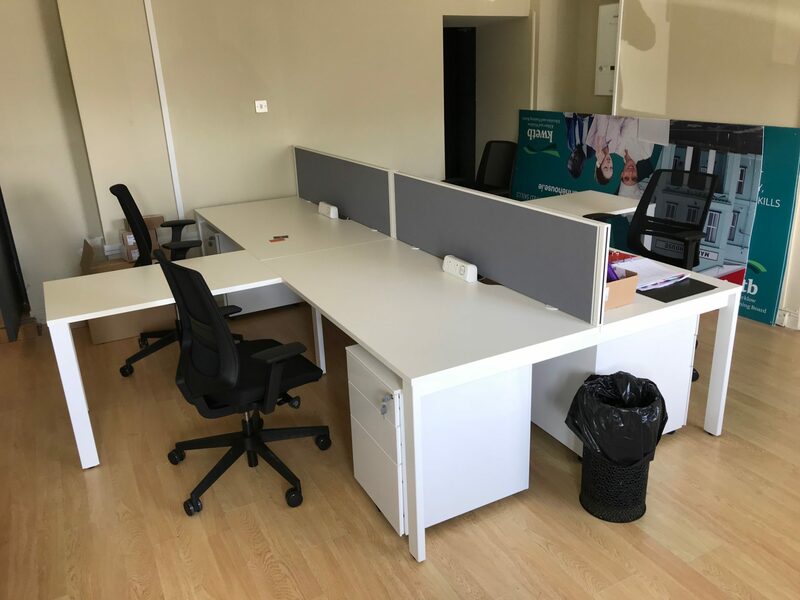 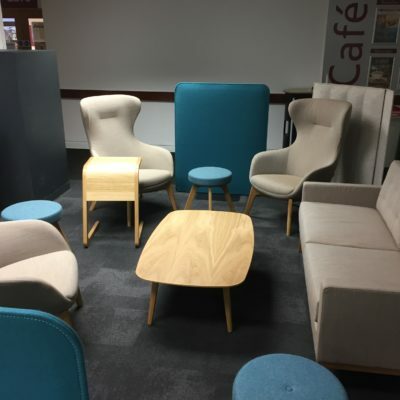 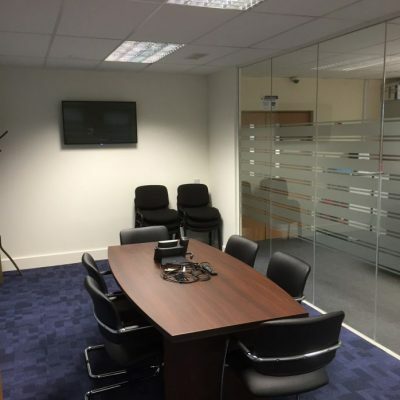 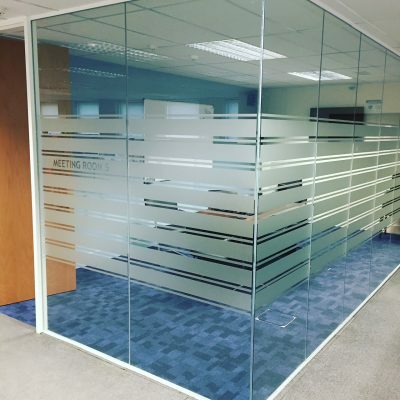 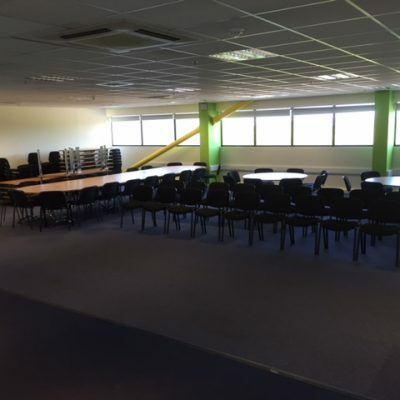 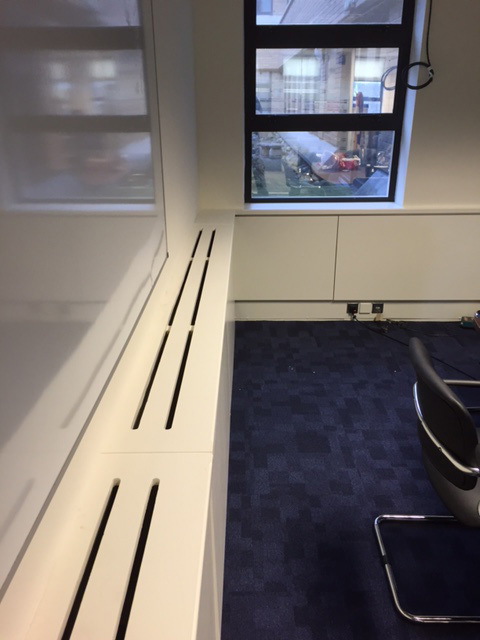 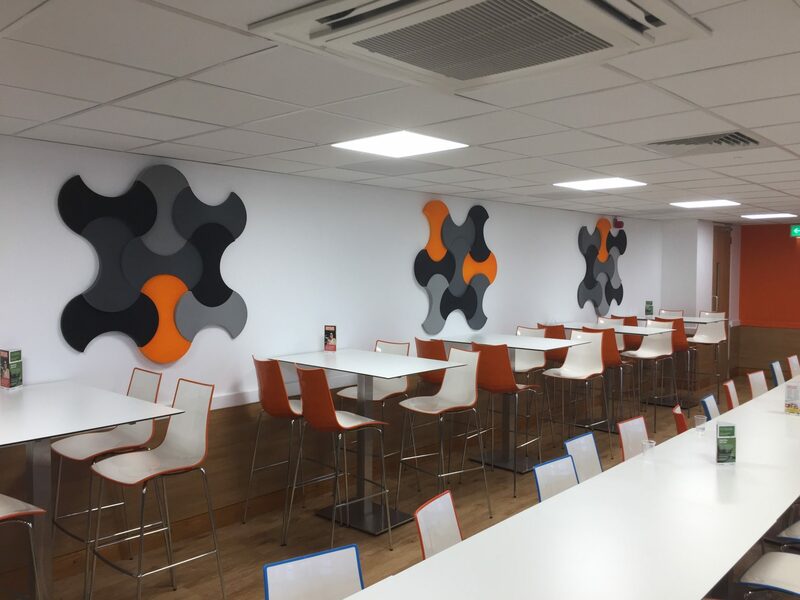 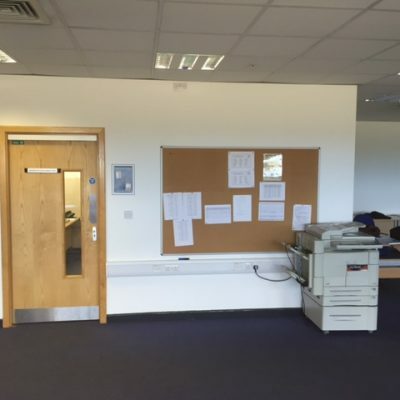 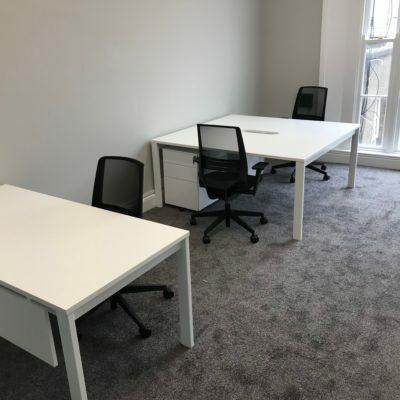 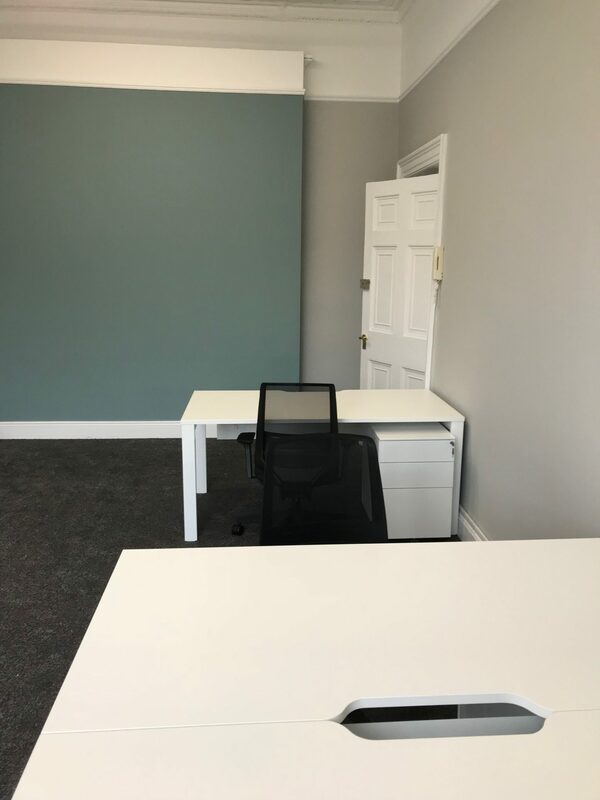 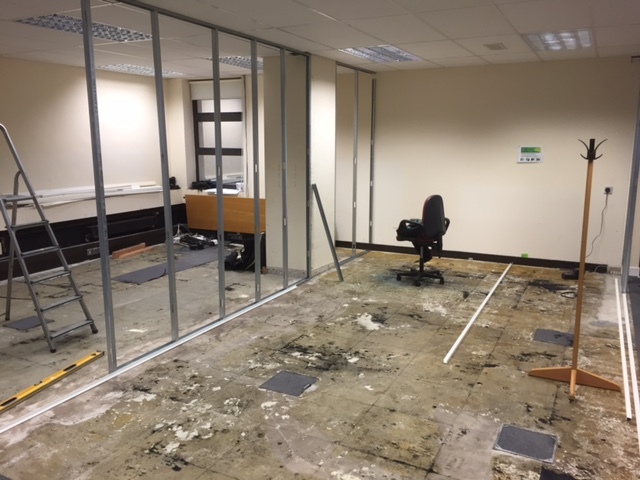 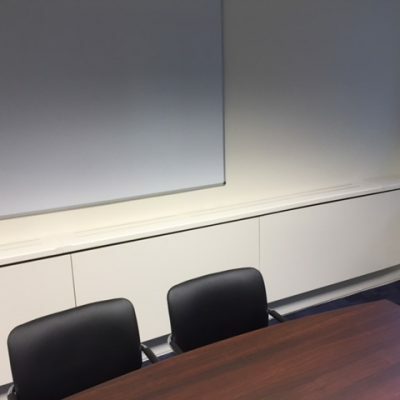 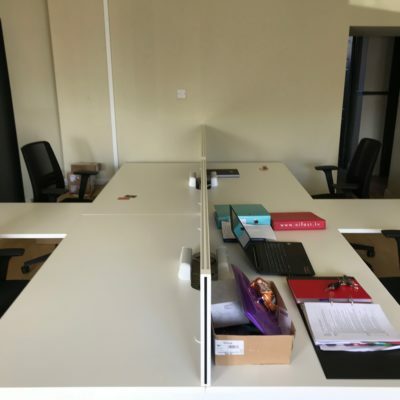 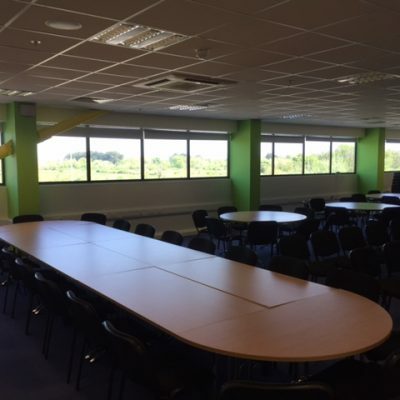 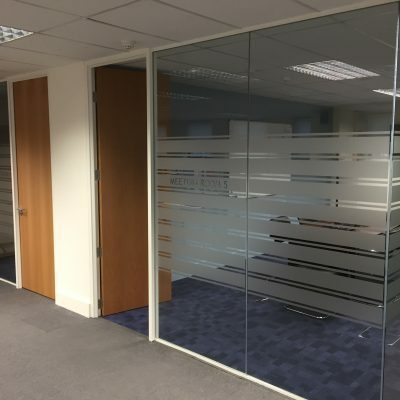 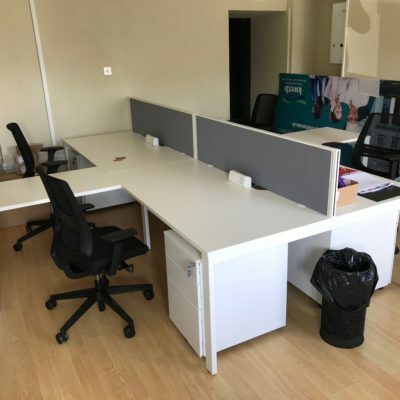 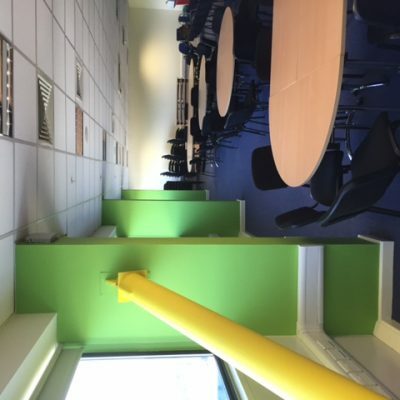 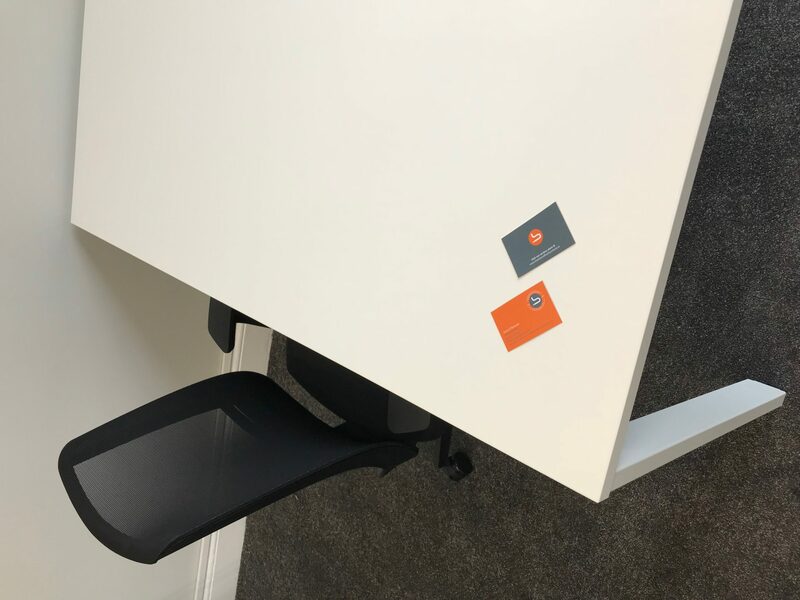 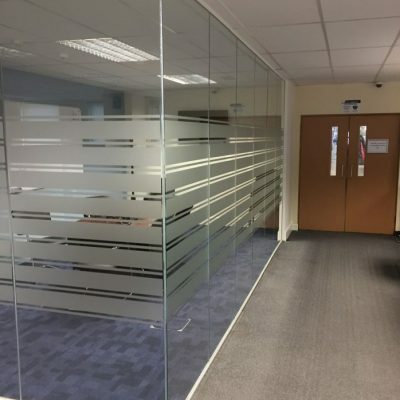 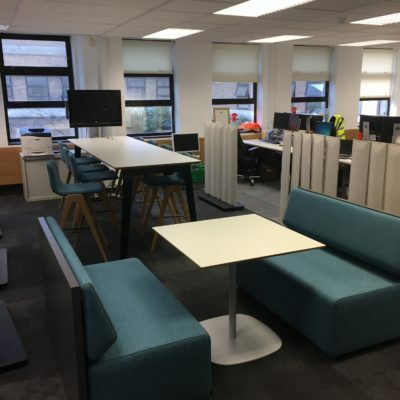 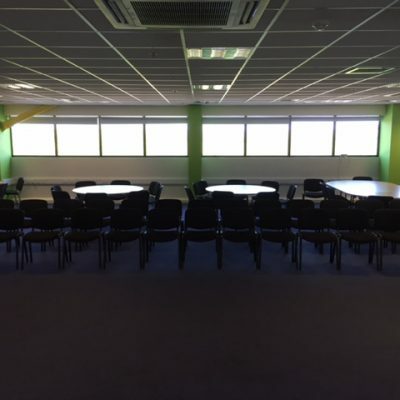 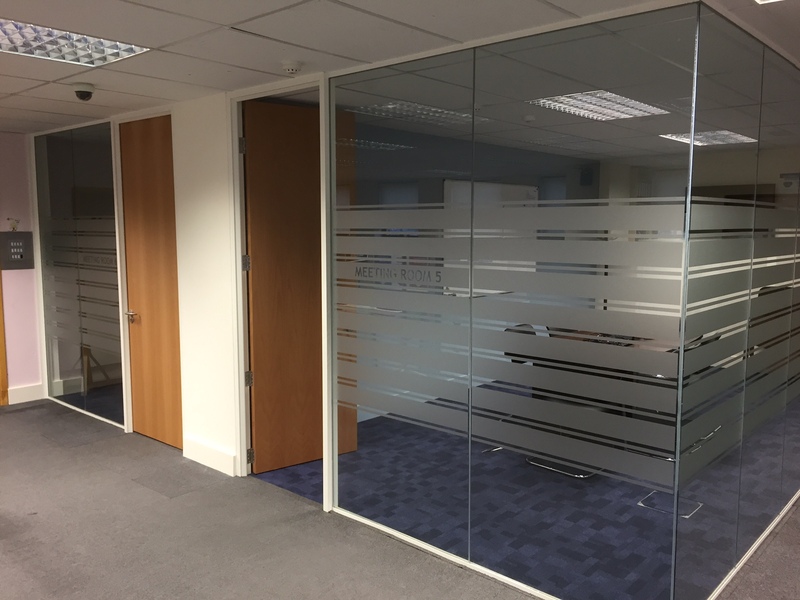 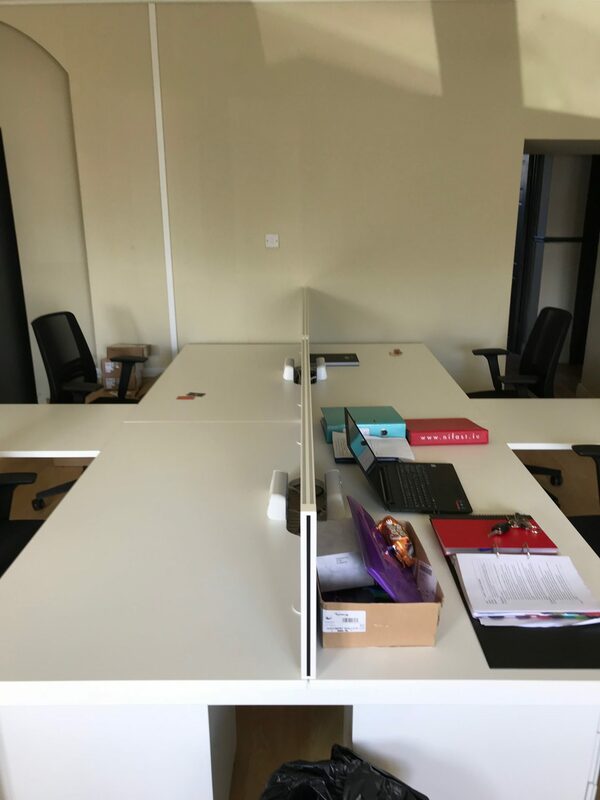 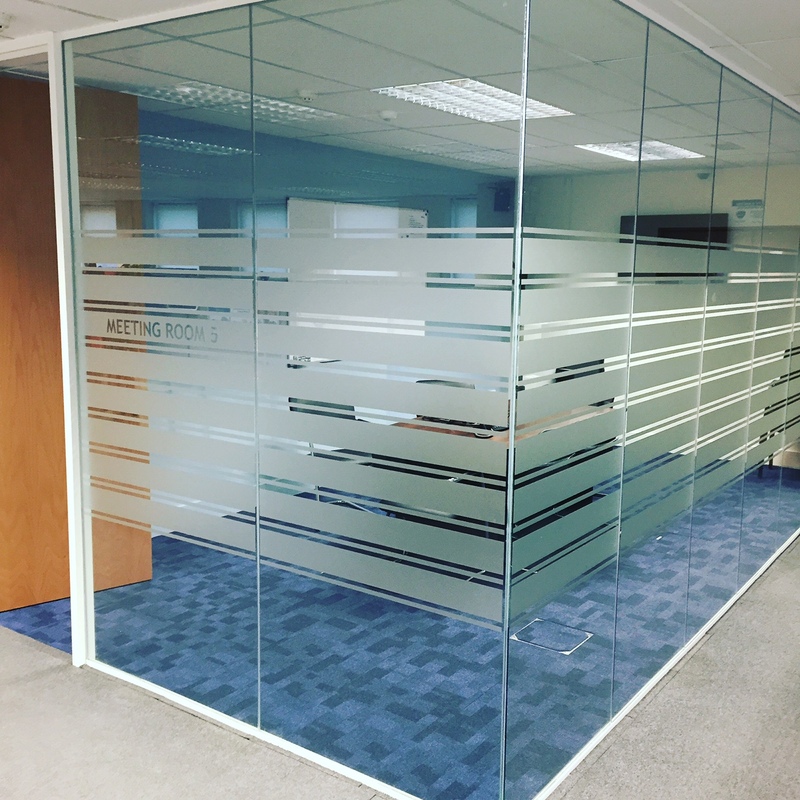 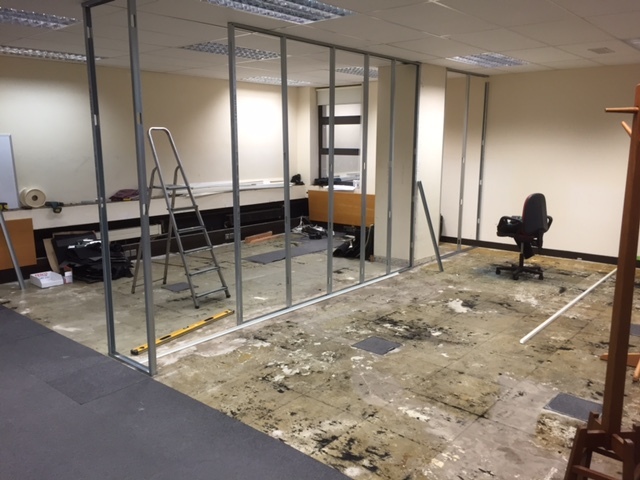 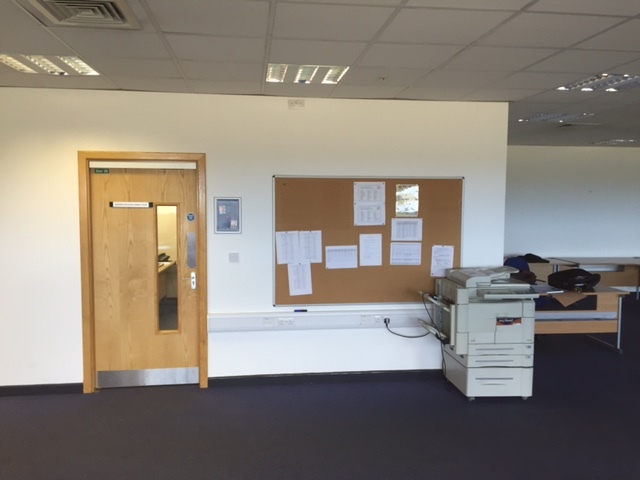 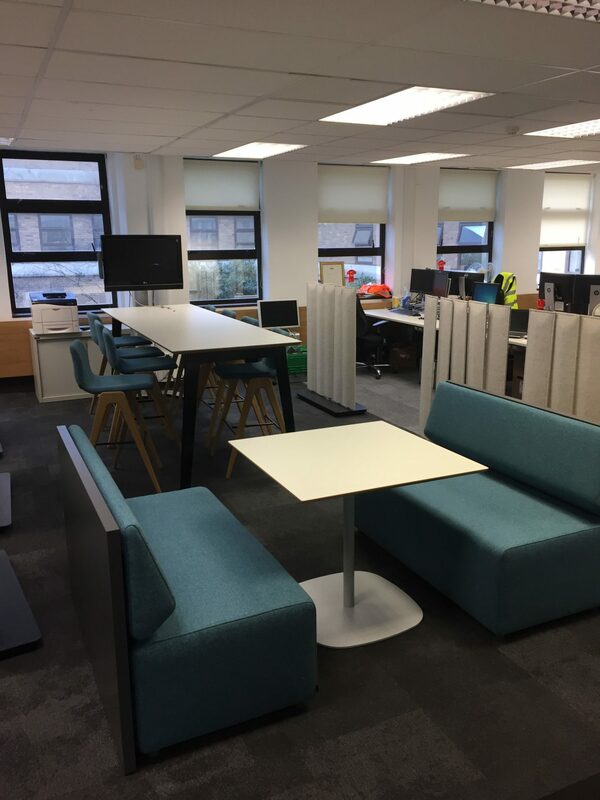 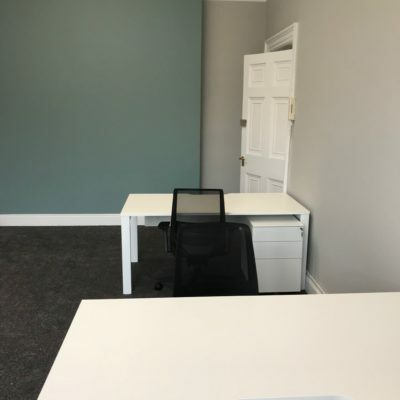 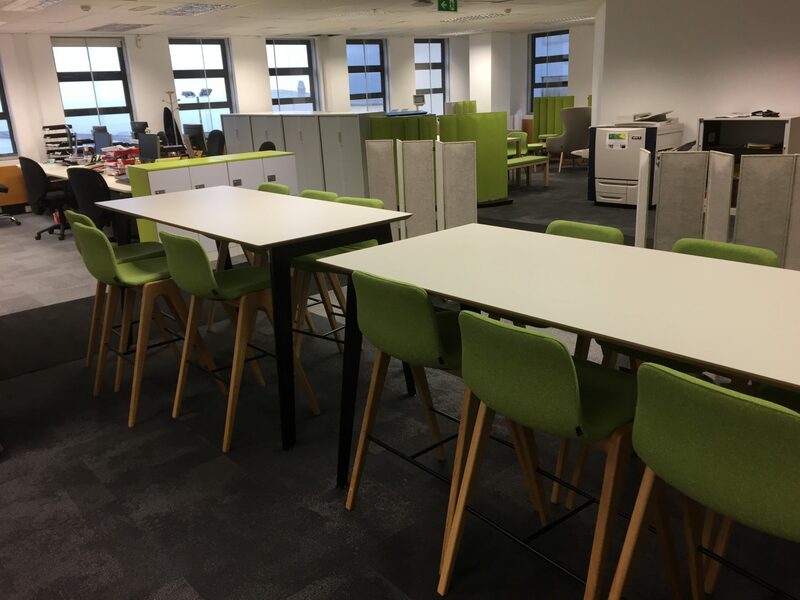 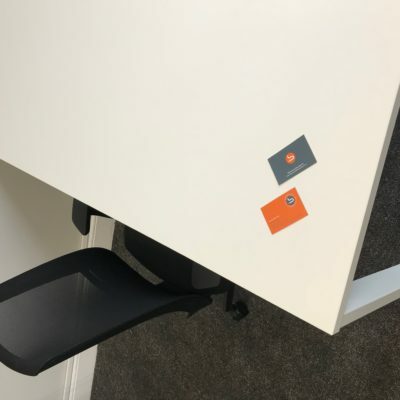 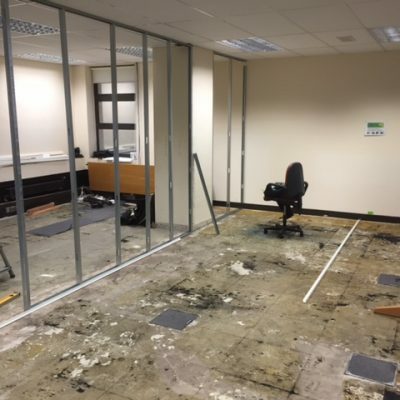 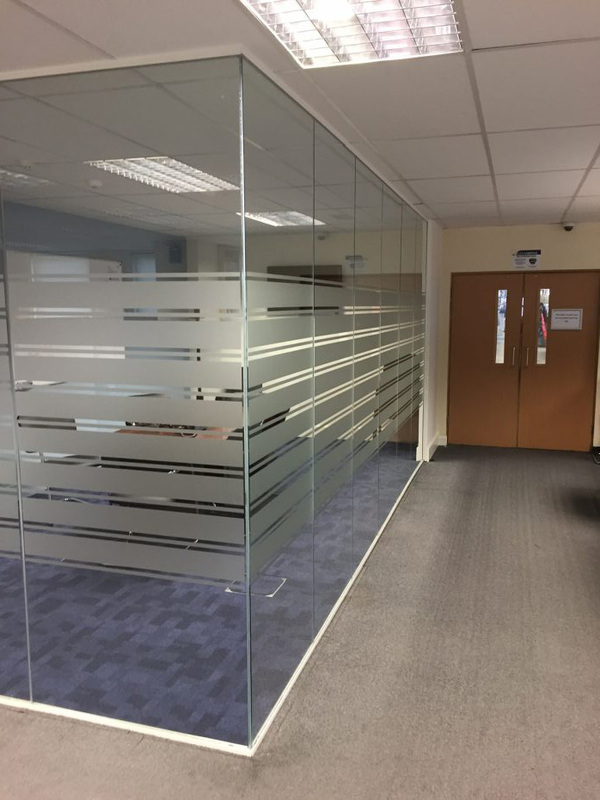 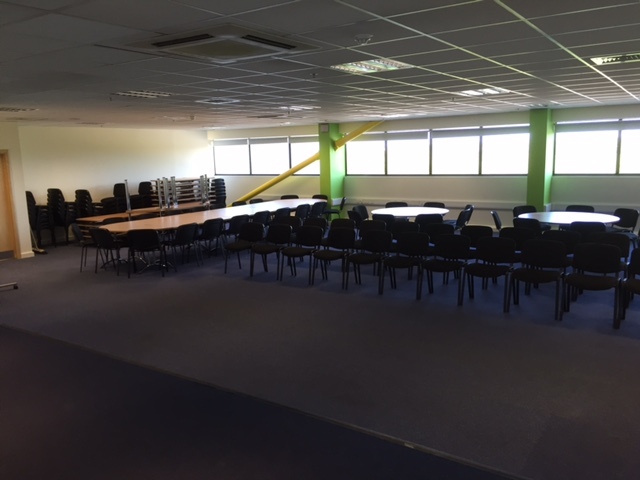 Works included the reconfiguration of the existing area, installation of glazed partitioning system, a full AV solution, carpets, painting, bespoke carpentry units and meeting room furniture. 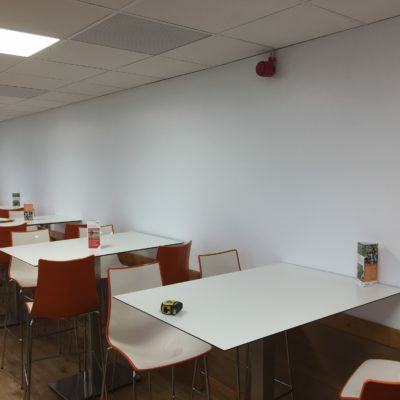 Works completed in time and within budget.